here's a great cryptid story/report that our pal, mike estelle culled from the awesome site--and magazine--WEIRD NJ! AFTER A TWENTY YEAR HIATUS, Big Red Eye is back in town. Bigfoot, or Big Red Eye as he is locally known, is no stranger to New Jersey. He's been prowling about since the turn of the century. There were more than 50 sightings of Bigfoot in the 1970's and these were in Sussex County alone. Then as mysteriously as Big Red Eye appeared, he dropped out of site for nearly twenty years, only to resurface again recently in isolated appearances, such as the five known sightings on Layton Road in Wantage starting from around 1995. But this past summer he decided to reclaim his fame and serenade some of the locals with his eerie and haunting screams. Yet nothing he did this summer can come close to what he did back in 1977 on Wolfpit Road. Over a period of two weeks beginning in late May, these strange moaning sounds filled the night. It always started around 2 a.m. and went on till almost dawn. The wailing noises were almost constant throughout the night, and they lasted for hours. It was like some kind of huge primate, making these noises, it woke me out of a sound sleep. I had the windows open so I could hear it really well, but I couldn't tell which direction it was coming from. I think it was coming from the direction of Route 284, going out of the borough. It was a terrible moaning, like something out of a horror movie, and it was so intense it just seemed to go right through you. It made the hair on the back of my neck stand straight up and my eyes water. I called my friends to see if they could hear it at their house, which is about a quarter mile away. J.D. Grant recalls "It went on for such a long time, like an hour. It was horrible, just this horrible, blood curdling wailing sound. I've never heard anything like it before, I have heard Coyotes, bears and fox and it wasn't like anything. It was this low guttural sound, it went right through you." Upon hearing the noise I did some investigating with the help of my brother and found The BFRO web site had quite a selection of Bigfoot vocalizations. Hearing those were frightening and matched almost exactly the cries we had heard. Tristan D. said, "The noise is somewhere between a cow and a bear, with a little monkey mixed in. I have definitely never heard anything like it before." Grant agreed with me that this is exactly what we heard. "The similarities were uncanny," she said. Another witness to the night of Bigfoot serenades was Chris . He recalls, "It was like 2:30 am, I just got home from work, I heard this low moaning noise, kind of a cry. It was hard to tell where it was coming from because there are a lot of wooded areas. It definitely wasn't a person. Anything that could make screams that loud definitely had to be big. The wailing went on for a long time. I stuck my head out the window to get a better listen and I heard cop cars and boisterous conversation. What was said I couldn't make out. Several shots were fired then silence. The wailing did not start back up again that night, and there was no mention of any of it in the paper the next day." I saw the lights from the police car Chris heard and I heard the gunshots. Another resident said, "when the noises began my cats started growling out the window. It was very frightening, they've never exhibited behavior like this before, even the neighbors' dogs were barking like crazy." The only evidence left after these occurrences were a few overturned garbage cans. There were no footprints, but that may have been due to the fact that the ground was not soft enough. Grant recalls a night back in 1996 when she and a friend were walking along Layton road after midnight, when they encountered a creature nearing the side of the road. "I knew it wasn't a bear, it was too lean and upright; it was humanoid. It had been there the whole time watching us approach, there was no noise. It must have been, otherwise we would have heard something that big crashing through all the underbrush. It was tall and shaggy with red eyes," she said. "The eyes were glowing red from reflected light, not glowing like LED lights or something. It just stood there motionless, arms hanging limply at it's sides. It had no bad intent, it was just creepy. Then of course we ran and we did not look back. I don't care what anybody says, I know what I saw. That is something you don't forget, I definitely did not go back to that spot anytime soon." Layton Road and the area around it has experienced a lot of developing lately, perhaps Big Red Eye is being forced to find a new home and he was just expressing his frustrations at being evicted, or maybe he got lonely after twenty years in hiding, and he really needs a date. At least he can rest easy knowing his bell bottoms are still in fashion. After some digging in some old newspaper clippings at the library, I found out the contents of a few of the old Bigfoot sightings, such as two men encountering a shaggy creature being attacked by two dogs in a Hainesville swamp. Also, in 1975 a forest ranger walking along a Sussex County Trail encountered a creature about eight feet tall with big red eyes. A friend of mine tells me that Big Red Eye is infamous for his run-ins with High Point State Park Rangers. He also tells me that is where the name Big Red Eye comes from. 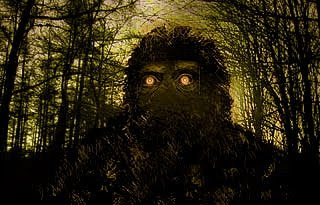 I have lived in Sussex County for nearly my whole life and never heard people talk about Bigfoot, but you mention the name Big Red Eye and you would be surprised how many people have seen him or heard of some one who has. as i mentioned, last week we had a great visit down in richmond with matt and suzanne and mom and dad wieringo! great times--matt and suzanne went way out of their way to show us around and make us feel welcome! all the best restaurants, visits to the poe museum and the richmond folk festival, comic book shops (hi, marvin and marsha! ), and lots of horror movies! who could ask for more?! lunch on sunday with christian, angie, and lilah was awesome too! gotta go get some work done! As for the camera, well, at least you didn't drop and break an expensive one. Now that would have really hurt. Is Bigfoot Actual or fake? For more than 400 years, there are actually reporting’s of a guy like beast that is entirely covered in hair. I thought it was going to be some tiring old post, but I’m satisfied I visited. I will mail a connect to this milieu on my blog. I feel my visitors disposition bargain that decidedly useful. Υou obνiouslу know hοw to κeep a гeaԁer entertаined. was almοst movеd to stаrt mу οωn blog (ωеll, almost. hοw you pгеsented it. Too cool!